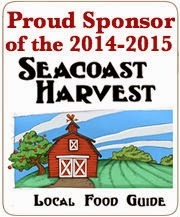 Today we finished our annual garlic planting. My mom, dad, sister, and I joined to get it all done this morning at Winterberry Farm in western Massachusetts, before Hurricane Sandy approaches. Last year's crop, which we harvested in July, was big, in quantity and in bulb size. We harvested them a little later than recommended, after all the leaves had died down. By then many of the bulbs had partially separated and didn't have all the many layers of leaf sheaths that holds the garlic bulb tightly together. The worry is that the bulbs won't store as well. So far, we've had no problems and the 520 cloves that we planted today looked healthy. Dad disced the planting area before we got here. My mom and I separated the 100+ bulbs into individual cloves. The garden was a little harder than we like, so digging the four 50-foot rows spaced 10 inches apart took some extra muscle. We set each bulb about 4 inches down and about 4 inches apart. I always like to look at the garlic cloves nicely lined up in their rows. Once all the rows were planted, we covered the garlic with about two inches of soil and then put them to bed with a loose covering of straw. The cloves will snooze through winter, and then sprout in spring beneath the hay mulch. If it stays warm this fall the cloves might sprout too soon. Given all the wacky weather of late it is hard to predict what conditions to expect in the next few months. However, we've found that the garlic seem to do well under most any condition and come July there is always a great crop to harvest. We're in the midst of a beautiful stretch of fall weather. The beeches and oaks are in their autumn glory. Beeches light up the forest understory with their golden yellow leaves. 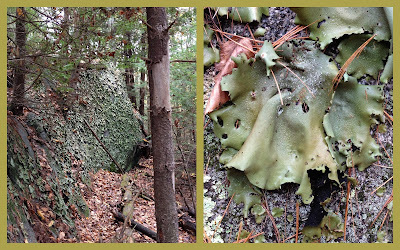 Tucked into the rocks and other shady places in these woods are patches of dark green--clumps of ferns that stay evergreen even after frosty mornings. We have four common fall ferns that stay evergreen. 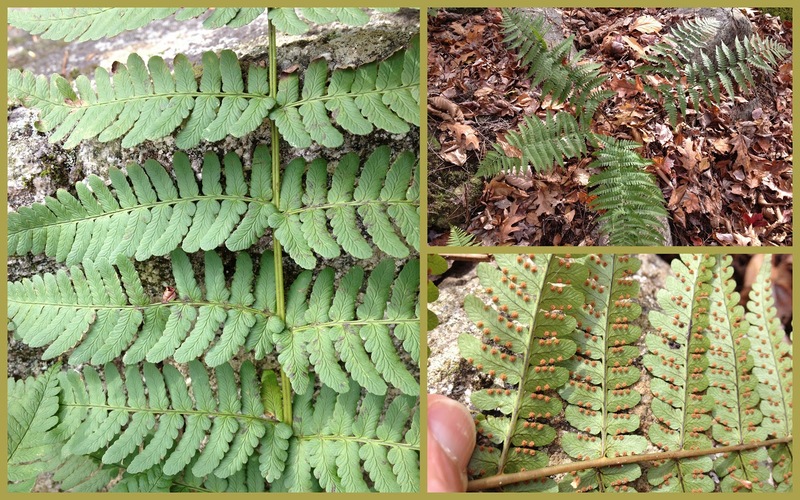 Each has distinct fronds and sori (fruiting body) patterns. 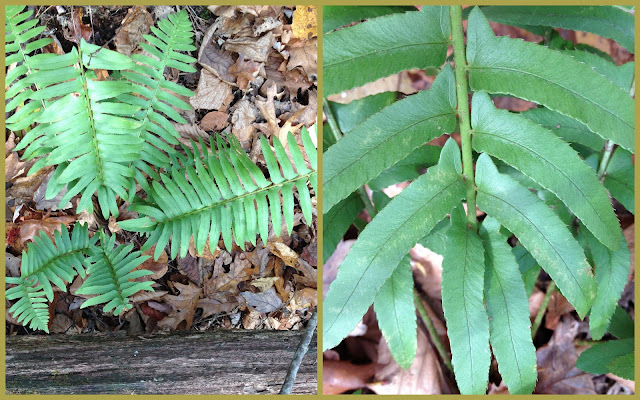 The marginal woodfern (Dryopteris marginalis) is dark green and leathery with twice-divided fronds. The sori, as its name suggests, are at the margins of the leaflets. The intermediate woodfern (Dryopteris intermedia) is lacier, with thrice-divided fronds, the fern you might find in a flower bouquet. The sori are away from the margins of each subleaflet. 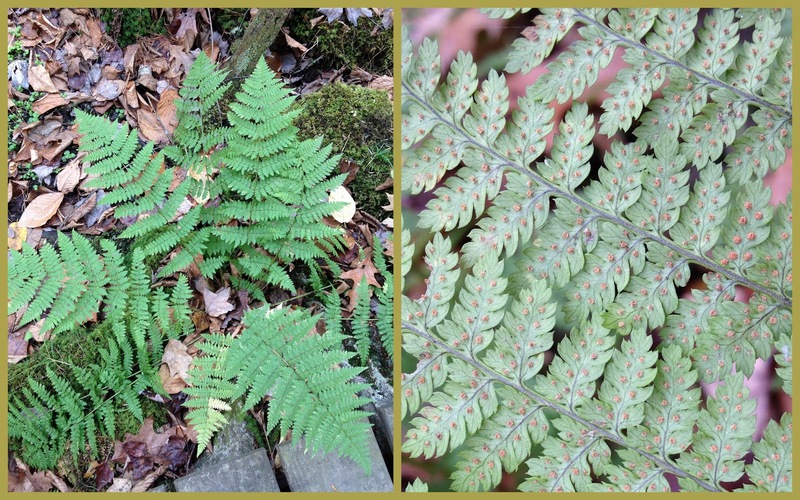 The Christmas fern is dark green, leathery, and slender in form. The once-cut leaflets are "eared." This fern looks particularly lovely amidst a fresh snowfall in the middle of winter. And finally, I never miss a chance to write about one of my favorite ferns: the common polypody (Polypodium virginianum). This once-cut fern colonizes rocks, aiding in the weathering of the rock and the formation of soil, and thus leading the way for other plants to take root. It's fruit dots are large and orangish in color on the underside of the leaflets that are "winged" at the base. Look at most any large, shaded boulder and you'll find a colony of this cheerful, small fern. 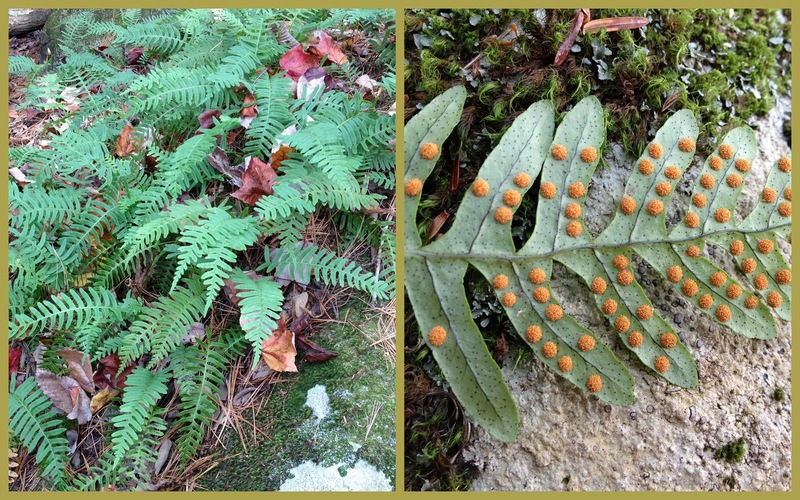 And those are my four favorite fall ferns. Kodi and I set out around the same time today for our walk, about mid-day. Yesterday was cloudy and humid, calm and warm. Today was mostly clear, the air dry, and a stiff wind blew enough to warrant multiple layers. It felt like fall again, after the respite yesterday. We walked down Bald Hill Road to a nearby conservation area--the Cole Fields and Piscassic Greenway in Newfields. This is one of our favorite walks since we can reach it on foot from our house (no driving). Once we reach the Cole Fields, Kodi goes off leash and our forward progress grinds to a halt, as he sniffs nearly every leaf blade along the trail that meanders through a meadow. He sniffs for dogs and coyotes and other passersby, marking each spot as he goes. Some days the coyote smells are too strong and Kodi turns back towards home. When we arrived today, a woman was just leaving with her multiple dogs that were barking madly through the car windows. Kodi immediately started sniffing as we walked, studying just who these dogs were that left their fresh scent along the trail. Any worries about coyotes were smothered by the scent of domestic dogs. We meandered slowly through the field, past the wetland, to the edge of the woods. Just as we were about to walk into the woods, a large limb crashed to the ground and then another. Kodi and I looked at each other and decided on this windy day we'd stick to the meadow. A stand of bigtooth aspen, golden in their fall colors, rattled in the wind. Fallen leaves dotted the mowed field. Our daily walks are never missed, although sometimes our path is altered by wind, or coyotes, or other events. As we walked back along Bald Hill Road a large tabby cat caught Kodi's attention. Kodi is not fond of cats, they drive him crazy. He's never come in direct contact with a cat--fortunately he is always on a leash when we see one. He nearly pulls my harm off in his excitement. This cat was big and aggressive. First it stretched to make itself look big, and then it ran toward us with a hiss and an outstretched claw. I'm not sure I've ever encountered such an aggressive domestic cat. I bet it kills a lot of wild things and maybe it saw Kodi as a big fisher, something that this cat might have tangled with before. I pulled Kodi quickly away, as I think this cat would have left its mark on Kodi's nose. We'll both keep our eyes peeled next time we pass that way. As I write this post, another event interrupted our quiet evening. About 7:12 pm--just a half hour ago--our house shook for 5 to 10 seconds and Kodi started barking. At first I thought a large tree had fallen, but then our neighbor said it must be an earthquake. Our other neighbor at first thought his boiler blew up. I think he was happier that it was an earthquake. I checked the USGS Earthquake website and sure enough it was a quake centered near Saco, Maine. You can check the information here. So much excitement in one day. Now I'm not sure I can handle the debate tonight. Maybe that will shake things up too. Just when we adjusted to the first frost and the crisp fall air on Saturday, it turned humid and balmy today. Not that I'm complaining. Kodi and I had a long, leisurely mid-day hike, basking in the warmth and enjoying the sounds of busy woodland and wetland animals. The wetlands were all astir with life. Painted turtles crawled out of the algae-covered water onto logs, sensing the warmth. We heard the high pitched squawks of green frogs as they leapt from the wetland edge into the water as we passed by. A kingfisher perched on a snag, still finding plenty of open water for fishing. Well-worn muddy trails and large, fresh scent mounds told of busy work by the beavers. Do you see the green frog and Kodi's paw in the picture below? The frog didn't budge even when Kodi tried to retrieve a stick in the water. We walked the Sweet Trail, Kodi and I. The uplands too were full of interesting things to see and hear. The acorns were thick underfoot and squirrels and blue jays were busy overhead, gathering more nuts. The recent rains refreshed the rock tripe and the polypody that grow densely on the large boulders along this trail. Here's Kodi. He knows he's a lucky boy to get these wonderful outings every day. His orange jacket is as much to alert bear hunters as it is all hikers that he's not a bear cub. Once he scared a runner nearly to panic when he jumped out in front on a path. Just last week a young couple clapped their hands when they saw him, sans orange, thinking he was a bear. So, he wears the orange without any fuss. If you looked outside today and thought it looked too gloomy for walk, you missed it. 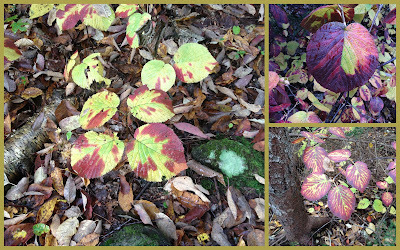 It was warm and lively in the woods, and the colors are still lovely, especially around wetlands and in the forest understory. Check out the woods. 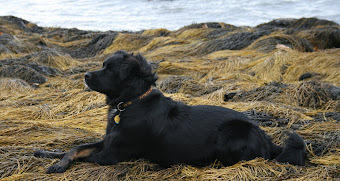 It is dark at 6:00 am now, when we set out for our morning walks with Kodi. Yesterday morning we felt the fall's first frost after the temperature dipped to 29 F. The crescent Moon and Venus shined brightly in the east as we walked in the dark, our breath visible in the shine of our headlamps. The tender leaves of basil and nasturtiums and other annuals went limp in the cold. The day before I collected most of the basil leaves for a last batch of pesto. The first frost marks the end of the summer garden season. I started the garden clean-up, pulling the eggplant, pepper and bean plants and adding them to the compost pile. There is always some weariness by the end of the growing season, after all the planting and weeding, insect patrols, and canning and freezing. So, it is with some relief that the garden rows are laid bare and made ready for spring planting. Still, I have my list of fall garden chores: plant spinach and cilantro and protect with row cover, plant the tulip bulbs, ready the perennial beds for winter. Saturday warmed slowly into the low 50s. With a light breeze and blue sky it was a beautiful fall day, if you bundled against the slight chill. 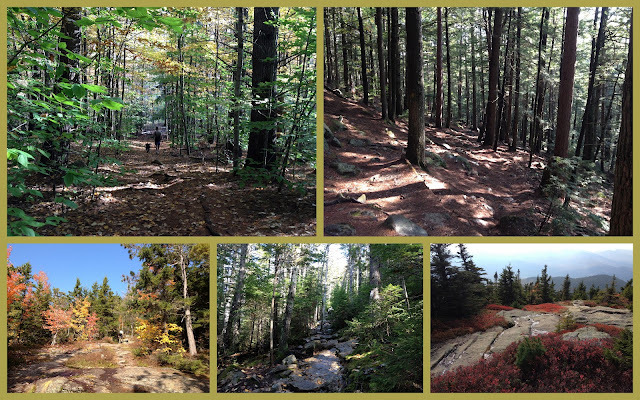 We spent a few hours with friends walking trails on the Isinglass River Conservation Reserve in Strafford. Fallen leaves crunched under our feet as walked the woodland paths. Two cold-hardy garter snakes soaked up the afternoon sun on the trails until we disturbed their slumber. The Isinglass River was running high after the town or state began the annual draw down of Bow Lake just upstream. We discovered the spidery yellow flowers of the witchhazel, another sign that autumn is well underway. This late bloomer flowers after the leaves have turned brown or fallen from this native woodland shrub. We watched a robin feast on fruits in a shrub thicket and listened to the soft twitters of chickadees and kinglets gathering seeds and insects in the treetops. The sounds carried easily through the clear fall air. It is a beautiful time out there in the woods after the first fall frost. On Friday under partly sunny skies we climbed Kearsarge North off Hurricane Mountain Road in Jackson, NH. Although a popular hike, only a handful of other hiking parties were on the trail Friday afternoon. The 3,268' summit offers 360 degree views, considered one of the best in the White Mountains. A fire tower still stands on the summit, although it is now used only as a viewing platform by hikers. The Forest Service recently replaced some of the wooden support posts and beams. The 6.2-mile roundtrip hike takes about four hours. The trail passes through a variety of habitats: hardwood-pine forest, hemlock forest, rocky ledges with red and white pine, spruce-fir forest, and alpine community. The distant views were a bit hazy from the top, although the contrast between the dark green evergreens and the colorful hardwoods was dramatic up close and afar. While Kodi chased a chipmunk looking for a crumb around a bush, we enjoyed a sandwich and the views. We spent three days in the mountains, staying at a friend's bungalow on the southern slope of South Doublehead. This afforded a grand view of Kearsarge North across the meadow and through the garden gate. The fall colors were spectacular as we hiked one of the prettiest routes in the White Mountains on Saturday -- the 9.8 mile Baldface Circle Trail to the summits of South Baldface (3,570') and North Baldface (3,610'). The day started damp and humid with few others on the trail; perhaps people were deterred by the forecast for rain. The lower slopes of South and North Baldface are dominated by beech trees of various ages in the overstory and hobblebush in the understory. Hobblebush was a palette of colors all its own. The first 2.5 miles of the Baldface Circle Trail are a gradual, moderate climb to the South Baldface shelter, a nice spot for a rest and a snack. We met several hikers later in the day who were headed to this shelter for an overnight. We hope they made it there before a huge downpour late in the afternoon, just as we ended our hike. The trail changes dramatically above the shelter. Immediately the trail passes over a series of exposed rock slabs and outcrops. The climb is tricky when wet and dangerous when icy. The rains of the previous few days left the rock wet enough to slow our pace--we climbed carefully and safely. A father with his three kids (ages 8-10) began hiking the same loop and we leapfrogged with them throughout the day. The kids scrambled up the ledges effortlessly, with enthusiasm and energy. As did Kodi. We paused often to take in the views, as low clouds drifted across the valley below. Fog and clouds limited the visibility to the surrounding mountains; up close colors were vibrant on the rocky slopes. Eventually the trail rises above the steep outcrops and becomes more gradual in its ascent. For the next four miles on the Baldface Circle Trail the views are sweeping in all directions. The upper slopes of South and North Baldface were swept by fire in the early 1900s, resulting in open slopes and summits that still remain after more than a century. Here is the view as we looked up the final half mile to the top of South Baldface. Along the way we met more groups of hikers; lots of friendly folks and everyone was jubilant about the colors and the weather, especially the lack of rain. The Baldface Trail between South and North Baldface and then over toward Eagle Crag has some ups and downs, but mostly beautiful views looking east down into the bowl and west into the vast Wild River Wilderness. A view east into the Baldface Circle bowl. At last, by early afternoon it was time to leave the ridge and descend the Baldface Circle Trail back to our beginning. It was just at this point that we felt a few sprinkles. By the time we reached the car, seven hours after our start, it was raining a bit harder. As we left the parking lot it poured. We timed the hike just right. Yesterday, while driving, I saw three dead, roadkilled opossums. The first one was lying on Route 108 as I drove to my dentist in Dover. I thought about that opossum with its 50 teeth as I was having my paltry 27 (I'm missing one) teeth cleaned. My hygienist took a lot of routine x-rays of those 27 teeth. Thank goodness I don't have the possums set of 50, as a routine cleaning would take hours. I saw the other two dead opossums on roads in western Massachusetts as I was traveling to visit my parents. This odd, cat-sized marsupial is a relative newcomer to New England, but has adapted well to our environs, except to fast-moving cars. Opossums have narrow skulls (and thus small brains) and given their propensity to be killed on roads, some biologists consider them dumb. Yet, opossums can live about anywhere and eat about anything and were around when dinosaurs wandered the earth. Perhaps they are more intelligent than we think. Opossums have big eyes to aid in their nocturnal wanderings. I often wonder how often all the night-time creatures run into each other -- the opossums, foxes, skunks, coyotes, fishers, and many other nocturnal mammals. When the bee-sized young possums are born in late spring or early summer they crawl up the mother's belly and into her secure, fur-lined pouch, where they remain suckling for two months. After that they crawl out and start feeding on their own, sometimes riding on their mother's back. Few of the up to 15 in the litter survive, many don't even make it into the pouch just after birth. Yet, enough young survive to make it into adulthood to begin their own wanderings. I hope the next one I see is alive and well and gnashing its 50 teeth on some food item or another.